Modern Australiana is fast becoming Instagram-worthy with more makers, artists and designers showcasing this beautifully unique country. Just search #ModernAustraliana and you’ll see what I mean! Eager to learn more about this emerging trend, I caught up with two women who have embraced “Australiana” and are redefining it to mean a whole lot more than clip-on koalas and mini-vegemites. 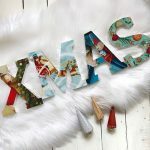 Carmel aka Puggle Post and Michelle from Snow Cherry Media both run small businesses specialising in Modern Australiana and great news is – from this collaboration, there’s something in it for you! 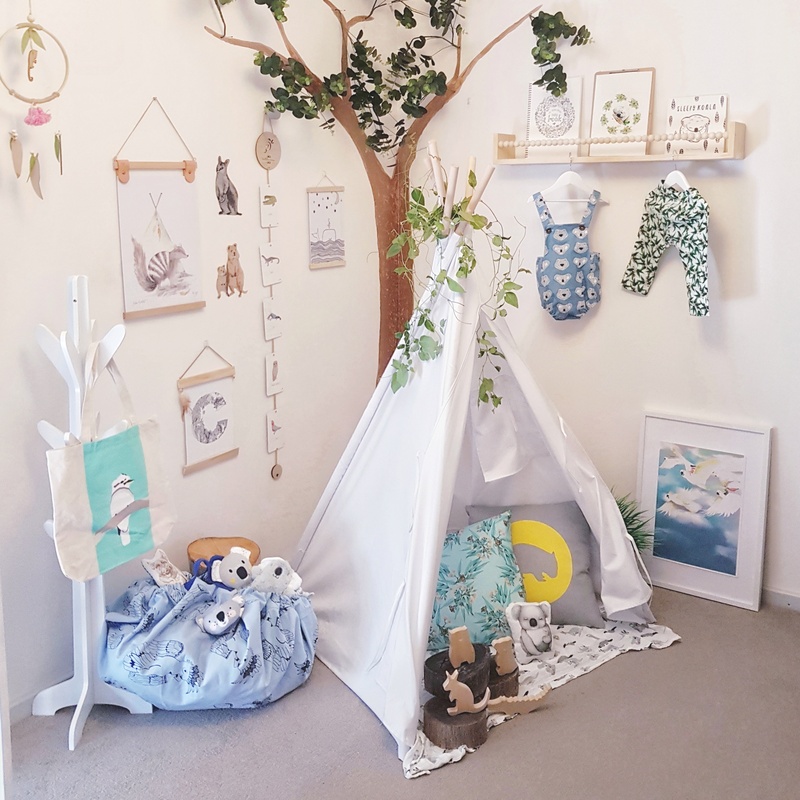 Michelle is the creative – As Snow Cherry Media she designs stunning prints, decals and clothing for home and the nursery featuring Australian flora and fauna in her work. 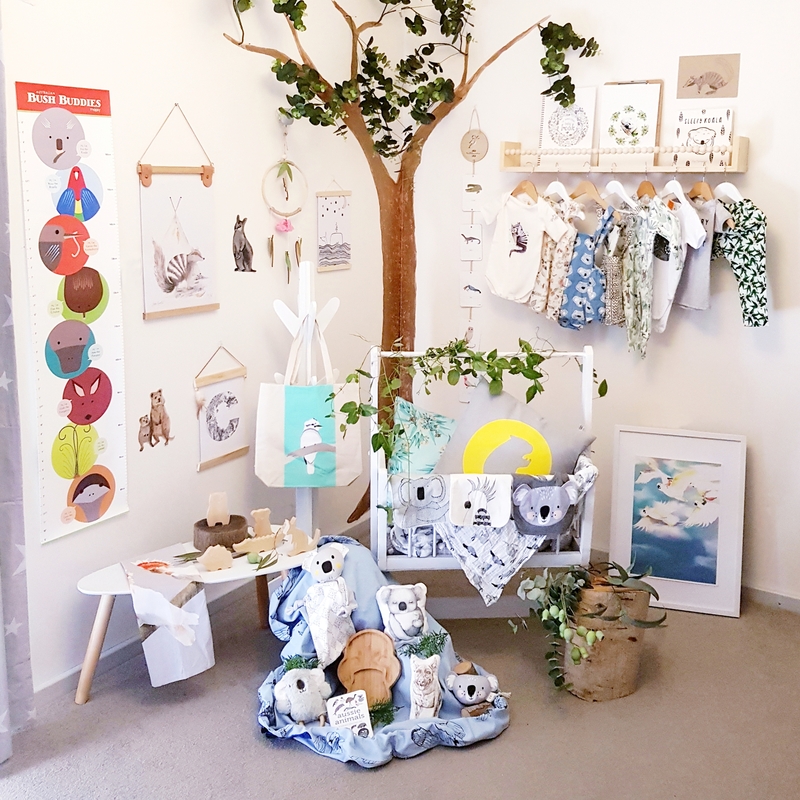 Carmel is curative – If you haven’t seen her gorgeous online kids’ boutique, you need to check out Puggle Post – selling a wonderful collection of puzzles, books, prints and décor, all inspired by Australia and sourced from Australian businesses. We found each other on Instagram of course! Carmel: Michelle caught my eye last year sharing her plans for an Australian woodland-themed nursery, and we’ve been talking Modern Australiana ever since! Michelle: Since then, we’ve discovered we’re not the only ones who are exploring this whole concept. There’s a thriving community of creatives and curators – all passionate about Modern Australiana art and design. For someone new to this concept, what is Modern Australiana? Carmel: Modern Australiana is a chic and modern take on Australiana. It is a celebration of Australian culture, places, and nature, in a stylish, minimalist way. It covers anything from homewares, artwork, to kids toys and clothing. Michelle: Often inspired by the outdoors you can expect to find natural materials and soft-tone colours. Carmel: Unlike mainstream Australiana, Modern Australiana is not really designed for the souvenir market, it’s more about creating a sense of connection. 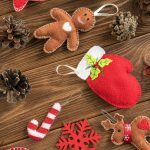 When I first started my business I thought I would mostly be catering to people in search of unique gifts to send overseas. But I was actually overwhelmed (in a good way) by the response from people here in Australia wanting quality, stylish Australiana for their homes and kids. Michelle: As the concept of Modern Australiana is gaining popularity more and more people are wanting to celebrate the Australia we know and love in a tasteful, understated way. I think Australians are a nostalgic bunch – we’re finding people are wanting to create a sense of connection, be it to their now, their childhood or to others. 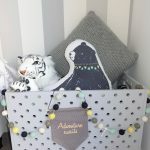 In particular, in kids’ décor and clothing, people are looking for something different to your standard foxes, wolves, deer, cats and rabbits, so for some, Modern Australiana is an opportunity to embrace something new, something familiar. Carmel: As a nation of outdoor lovers, we’re finding that this concept really aligns with a sense of responsibility to our wildlife and environment. Many people are wanting to foster that same respect in their children and what better way to do so than by introducing Australian animals to their surroundings and everyday conversations. Michelle: A lot of Australian wildlife is threatened, so as well as celebrating its beauty and uniqueness, I have a desire to spread the message about the importance of protecting and conserving these species hence my detailed illustrations. Wouldn’t it be great if children could identify a bilby over a ‘bunny’ and an echidna rather than a hedgehog!! 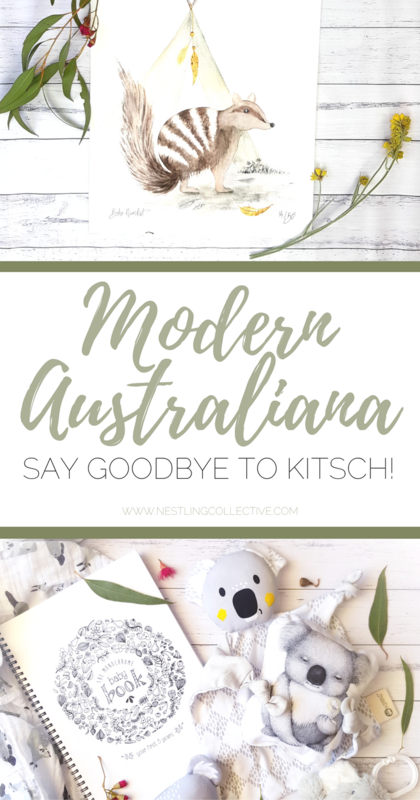 Modern Australiana - Say Goodbye to Kitsch! What type of business are creating and selling Modern Australiana? Carmel: There is a real range of businesses out there who have embraced Modern Australiana. From small handmade businesses, textile designers, artists, illustrators, small clothing brands to larger brands that are then retailed throughout Australia and then internationally. There are also retailers who include Australiana products in their range, as well as contemporary Indigenous artists and designers with a desire to bring a fresh angle to their work. 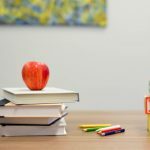 We’re seeing that environmental and social responsibility is important to many of these businesses, with a leaning towards natural, organic and ethically sound products. Will we still see the odd koala? Carmel: Of course! And kangaroos, gum-leaves and wattle… But what you’ll notice is HOW these are represented has changed. There’s a real sense of maturity, but also whimsy and enchantment. Michelle: We wanted to bring together and support as many businesses as we could to showcase how beautiful Modern Australiana is when it’s done well. And now that Spring is here, to celebrate this sense of new beginnings, we wanted to focus on products for babies and nursery décor. Twenty six businesses from this inspiring and creative community have joined together to present their take on Modern Australiana. And the most exciting part is that we’re giving away every single item featured here, totaling over $1500 in value in our competition over on Instagram! This great country has been waiting for ‘Modern Australiana’. It’s time to revolutionise the way such a diverse culture can feed into our life style today. So many beautiful and authentic items are now readily available. Well done to all concerned!